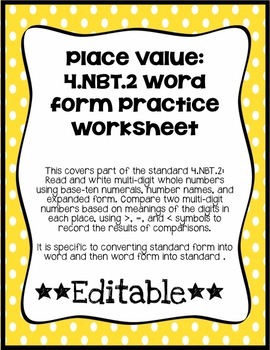 This is a worksheet that covers part of the standard 4.NBT.2: Read and write multi-digit whole numbers using base-ten numerals, number names, and expanded form. Compare two multi-digit numbers based on meanings of the digits in each place, using >, =, and < symbols to record the results of comparisons. It specifically covers the part of the standard with word form. This worksheet converts standard form into word form and word form into standard. 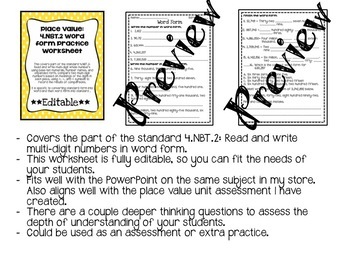 It is editable so you can change it to fit the needs of your students. The answer key is included. It can be used as an assessment or as practice. There are some deeper thinking questions to help assess the depth of understanding of your students or to help promote discussions.